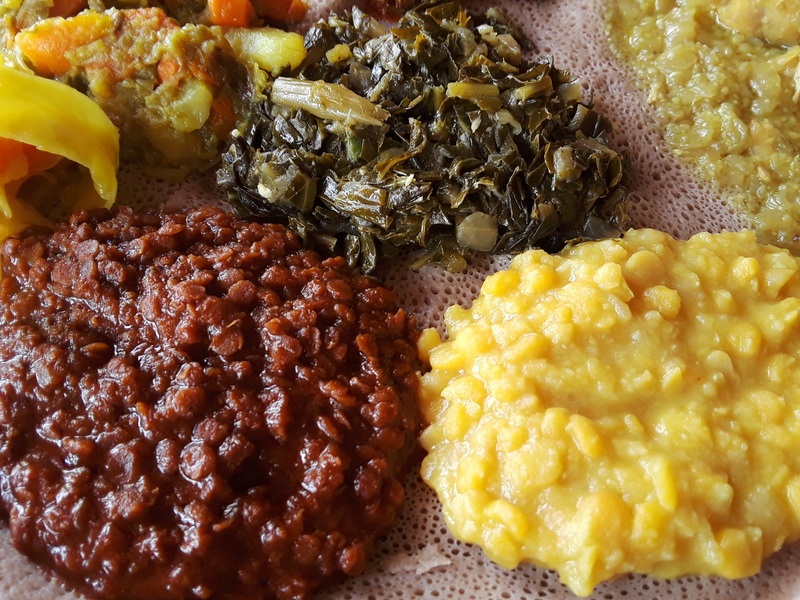 A recent visit to a new discovery was in Silver Spring, MD, an area chokeful of Ethiopian eateries of which some I have enjoyed eating at. 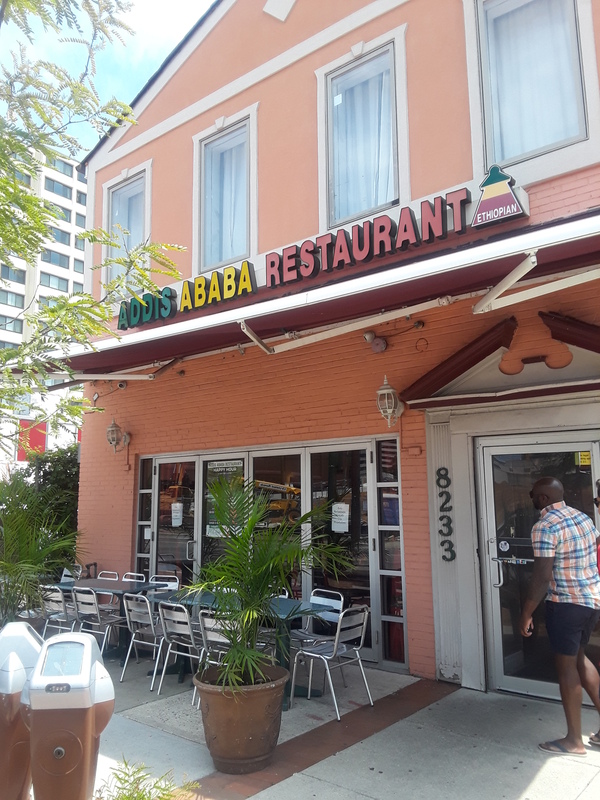 When I read up the online reviews for Addis Ababa Restaurant, I was reassured by its high ratings and effusive reviews. 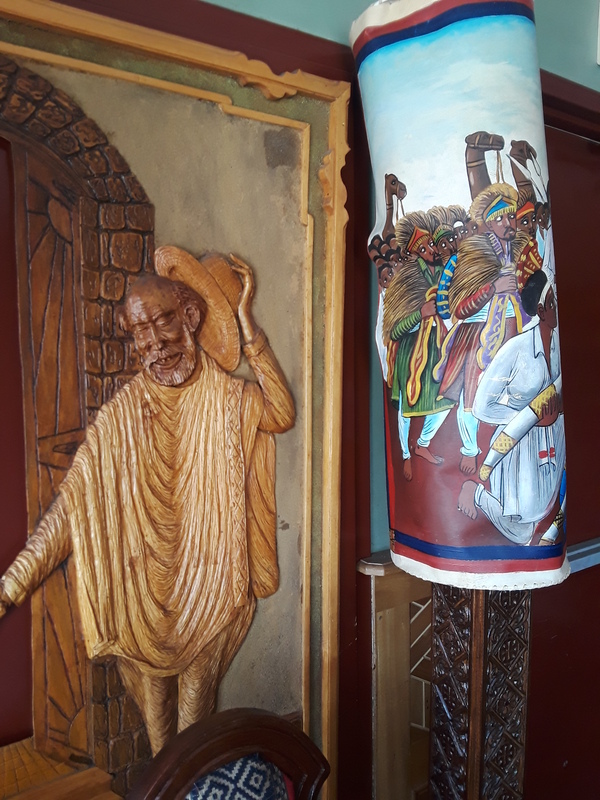 Walking into its door was an immediate transportation to a different world and time frame due to the decor and furniture, all speaking of authenticity and pride of the Old World. 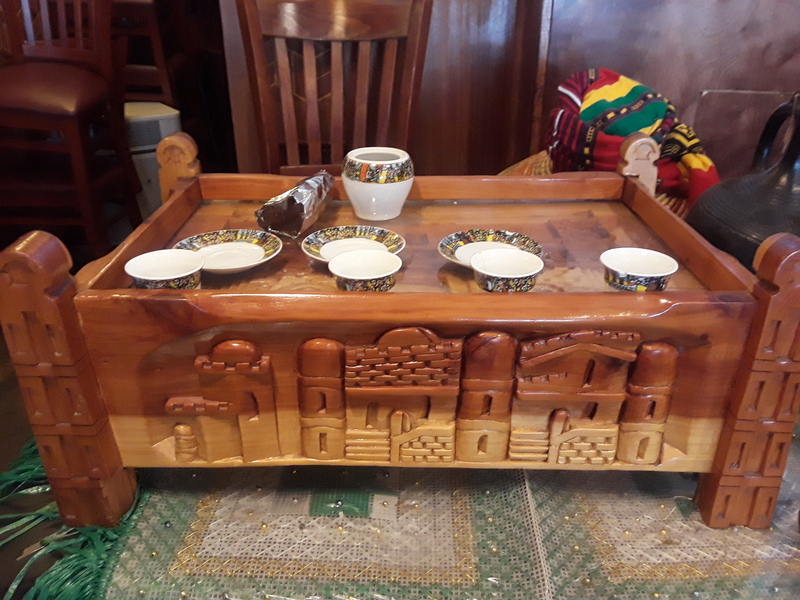 My eyes were already immediately feasting on the visual candy, especially the table of coffee cups that hinted of the Coffee Ceremony that I was lucky to partake in before. We quickly narrowed our choices to the Vegetable Platter with a couple of meat dishes. 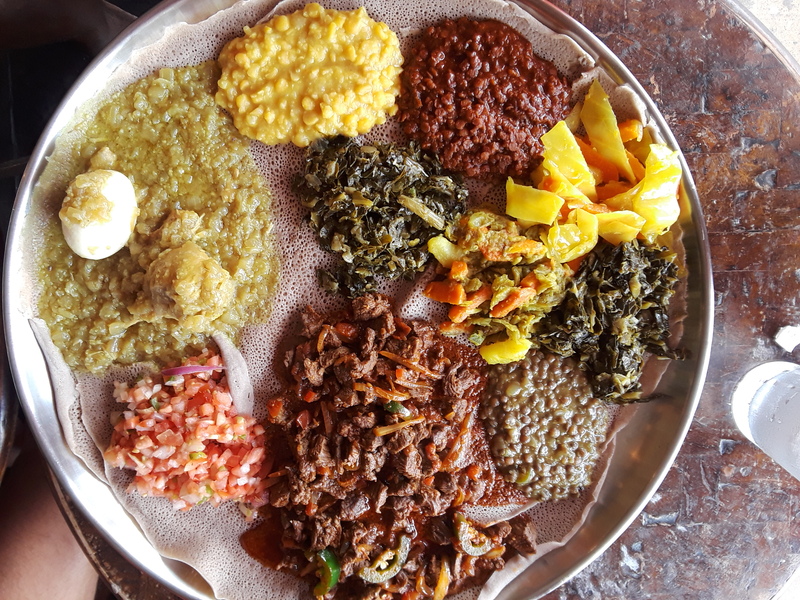 The true litmus test, for me at least, of Ethiopian food is the flavors and treatment of the different pulses and vegetables that I am extremely fond of. The red lentils were made spicy and smokey by the use of the berbere pepper sauce, with a hint of sweetness to balance the heat. The yellow lentils were cooked just right with lots of savoriness complementing its onion sweetness that made this mild bite very irresistible. 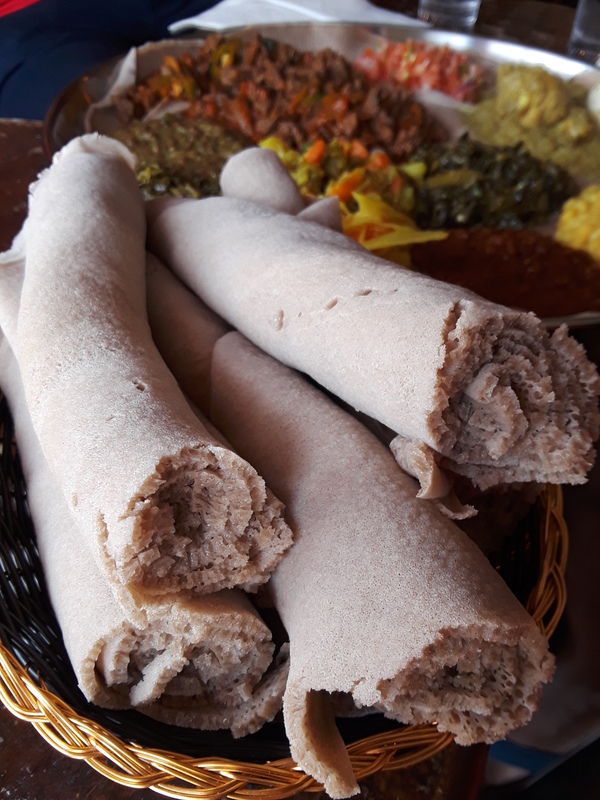 The injera bread was fresh with its usual sour note that made it the perfect foil and eating scooper for the various elements on the large platter. The rest of the vegetable elements were equally impressive. The beans were extremely exquisite with a high degree of savoriness that made me coming back to it often. The cabbage and carrots were cooked just right without any mushiness that exuded their natural sweetness with a good amount of garlic that I enjoyed. The collard greens were cooked to the right degree of doneness, but it was missing the right amount of vinegar sourness that would have elevated its flavor and lightened its mouthfeel. Admittedly, at this point, I would have been completely satisfied by this vegetable platter and nothing else. The first meat dish was Awaze Beef Tibs. 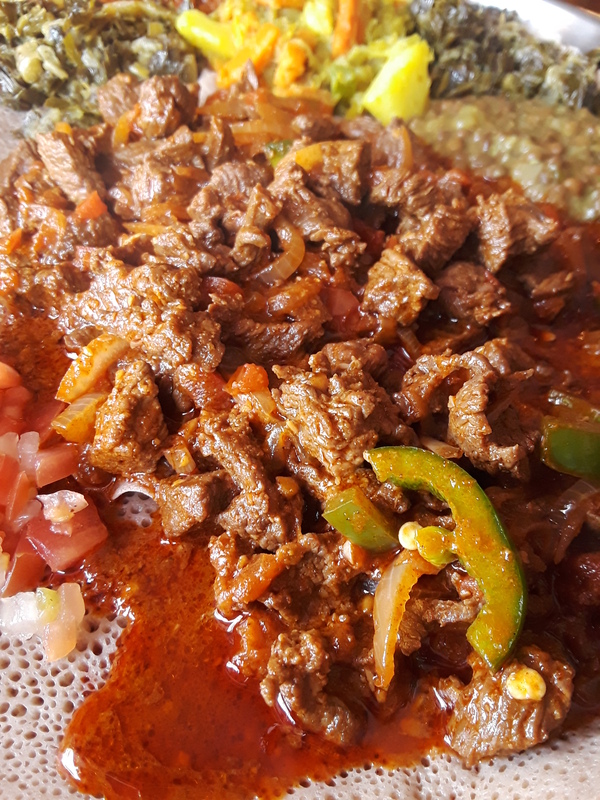 Pieces of beef are sautéed with the berbere pepper paste, onion, and jalapeño pepper. The flavor profile was just right with the proper heat and smokiness from the pepper paste, sweetness from onion, and the fresh green pepper adding more heat and its fresh vegetal note. The choice of meat cut was unfortunate as it was a bit gristly for my liking. But I kept returning to it due to its wonderful flavor and its generous portion. 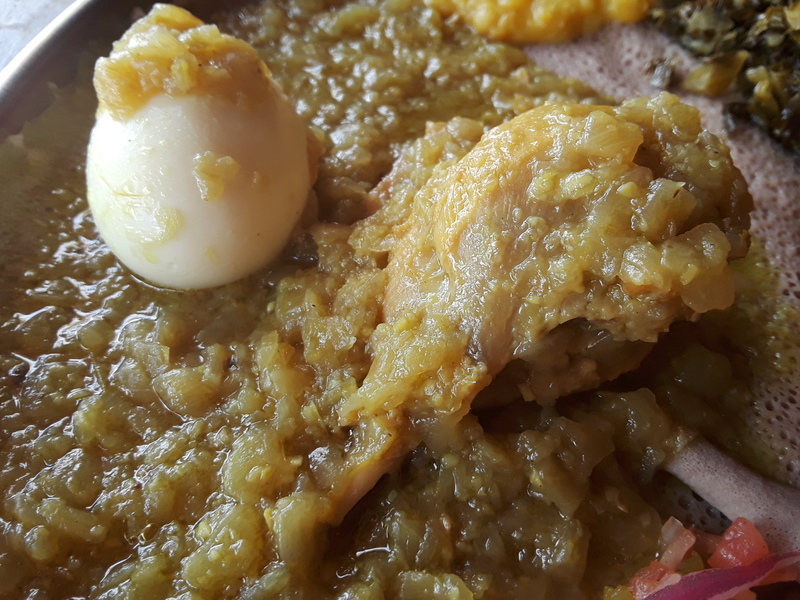 A must order and litmus test in any Ethiopian restaurant is a chicken-and-egg dish – Dorowat. When ordering, I was surprised to find out that there is a mild version to the usual spiced up version called Alicha. What arrived was completely unexpected and a far cry from its usual fiery looks, but its mild yellowish sauce came with its usual drumstick and single egg. From my experience in other establishments, this dish is really about the sauce itself, and this version did not fail in this regard. It tasted very savory and slightly sweet from a good amount of onion that also added some textural body to the whole mix. The chicken and egg were properly cooked, but they played second fiddle to that awesome sauce. This mild version wowed me as much as the spicy original one, and I would not hesitate ordering it in future visits. My meal at Addis Ababa Restaurant checked off many boxes in my books. The decor was transformative and extremely appealing to this world traveller, complemented by an amiable service. The Vegetable Platter was as good as it gets with the different pulses and vegetables having a differentiated flavor profile and cooked to the right degree of doneness. The Awaze Beef Tibs had the right flavors but a slightly better cut would have made it perfect. The mild Dorowat chicken dish was a total surprise, and its savoriness equaled the usual spicy version. With this type of cooking in a warm inviting environment, I will be returning to this wonderful place for one of my favorite cuisines.